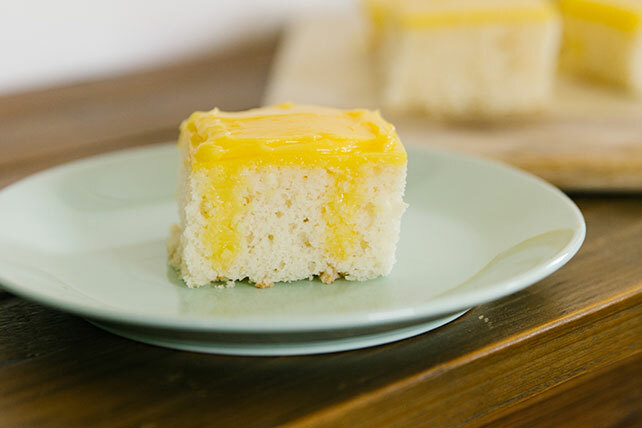 Experiment with something new using our Lemon Pudding Cake recipe. Lemon Pudding Cake is a poke cake that contains colorful bands of instant pudding. Prepare and bake cake mix as directed on pkg. for 13x9-inch baking pan, using the egg whites, water and oil. Remove from oven. Immediately poke holes down through cake to bottom of pan with round handle of wooden spoon. (Or, poke holes with a plastic drinking straw, using turning motion to make large holes.) Holes should be at 1-inch intervals. Pour milk into large bowl. Add dry pudding mixes. Beat with wire whisk 2 min. Immediately pour about half of the thin pudding mixture evenly over warm cake and into holes to make stripes. Let remaining pudding mixture stand until slightly thickend. Spoon over top of cake, swirling to "frost" cake. Refrigerate at least 1 hour or until ready to serve. Cut into 24 squares. Store in refrigerator.